TORONTO — The procedural deadline to add Rule 5-eligible prospects to 40-man rosters around baseball came and went Tuesday night, and there were relatively few surprises when it came to the Toronto Blue Jays. The Jays added five players — all pitchers — which now gives them a full 40 names heading into the meat of the off-season. With the non-tender deadline set for Nov. 30, another, more significant shuffle could be on the way, but here’s what you need to know about how the five players added fit into the plans, as well as who was left unprotected for rival clubs to sift through at the Dec. 13 Rule 5 Draft. After acquiring Thornton from the Astros on Saturday, adding the right-hander to the 40-man was a mere formality. At this point, Thornton should be viewed as one of the favourites to lock down a spot in the back of the rotation with a strong spring training, but more established arms will be added to that competition, either via free agency or trade this winter. Either way, the Jays view him as a legit option after making 42 Triple-A starts over the past two seasons. The most surprising addition, the Jays decided the immediate rotation depth Waguespack provides was more important than adding a reliever or a position player like outfielder Forrest Wall. Even though he pitched to a ho-hum 4.80 ERA in 122 innings last season, there are things to like about the 6-foot-6 righty. His groundball rate jumped to well over 50 per cent last season at each stop, while his 3.49 FIP in 39.1 innings with the Triple-A Buffalo Bisons is much more encouraging than his 5.03 ERA. Perez has the most prospect pedigree of anyone the Jays needed to add Tuesday, with MLB Pipeline tabbing him as the 11th best prospect in the system. Blessed with terrific pure stuff but without the command to match, it will be interesting to track Perez in 2019. With only seven Double-A starts under his belt so far, he could start at New Hampshire and work his way up to Triple-A Buffalo quickly if he excels. Taking home Florida State League pitcher-of-the-year honours in 2018 means Murphy is ready to lay his cards on the table in Double-A next season. 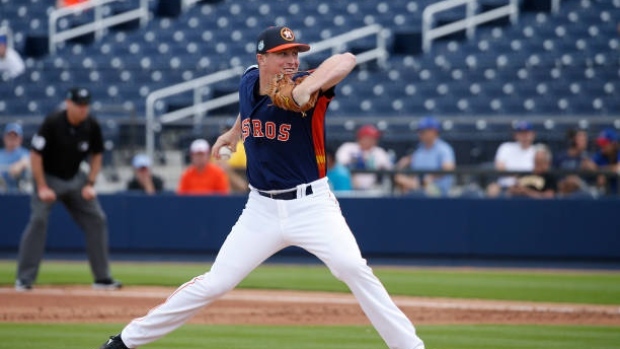 The 6-foot-4 right-hander made one appearance for the Fisher Cats this past year, striking out six and allowing just two runs in a six-inning spot start. Another full season in Double-A like he just had in High-A will really put Murphy on the map. Command improvements led to Diaz’s best campaign yet, but the Dominican righty just turned 22 earlier this month, leaving oodles of interesting upside. It’s an arm that the Jays deemed too electric to leave unprotected, even if he’s likely further away from the majors than the rest of the pitchers currently on the 40-man roster. The Jays decided to leave relievers Travis Bergen and Corey Copping, acquired at the trade deadline in exchange for John Axford, unprotected, and their bullpen-only upside is the reason why. Each and every player protected Tuesday is seen as a potential rotation option, while these two are not. However, Copping and Bergen, a southpaw, are both ready for Triple-A and could factor into the Jays’ bullpen mix in 2019 if they’re still in the organization. The fact they left Markham, Ont., product Jordan Romano off the 40-man for the second straight winter probably says a lot about how they view the 25-year-old’s long-term rotation potential, but they’ll be hoping he sneaks through like last December.